Both the Fluval Spec III and Spec V Aquariums make great homes for Betta fish, otherwise known as Siamese Fighting Fish. Many people make the mistake of keeping their Betta fish in very small, 1 gallon containers sold at the fish store. If you are at this page, you probably realize that this is a mistake and want your wonderful Betta to have a better home with more water. The Fluval Spec aquariums are a great choice to house a Betta, either the three gallon Spec III, or even better – the 5 gallon Spec V. Having 3 or 5 gallons will make the water parameters much better for your fish. Betta fish are a breed of fish with some specific needs; I will tell you how to make your Fluval Spec aquarium Betta friendly. Betta’s are no different than any other tropical fish: they need good water parameters to survive and thrive. They like high quality foods. 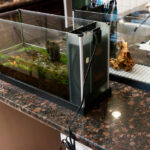 Water parameters will stay better longer if you keep a few live plants in the aquarium. Keeping Betta’s is simple, but they have a few special needs. Betta’s are known for their ornate and flowing fins. This means that they like an aquarium with slower and gentler water so that they are not constantly buffeted by the high flow. Since they are a tropical fish, they prefer water temperatures in the upper 70’s, preferably keeping the temperature in the range of 78°F to 80°F (25.5°C to 26.7°C). Let’s look at how to make these conditions work in a Spec aquarium. The Fluval Spec aquariums have a great leg up on the standard 1 gallon bowl that many people keep Betta fish in because of the great internal filtration pump. This will put you way ahead of the curve for maintaining good water conditions. However, this internal filtration pump also leads to the main shortfall for keeping a Betta in that the water flow is simply too great. Without some modifications the resulting currents will be too high and will buffet the Betta’s large fins and wear him or her out over time. 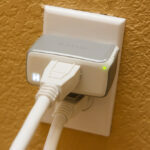 This causes stress, which can lead to sicknesses/disease and may shorten their life. The good news is there are several easy ways to reduce the flow rate in the Spec aquarium and make it more Betta friendly. The first is the simplest. The stock pump has an adjustment on it to vary the flow rate. It actually does not change the pump speed but simply serves to impart a flow restriction at the water intake to the pump. 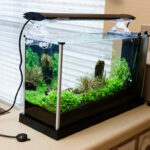 This restriction will lower the flow throughout the aquarium and make life easier on the Betta. The adjustment is found on the side of the pump; there are labels with a ‘plus’ and a ‘minus’. Simply slide the baffle to the ‘minus’ side and that’s it. For keeping a Betta, I would go ahead and move this all the way to the lowest flow. The second modification is a bit more involved, but very effective to reduce the flow rate in the main display. The outlet from the pump travels up through the flow tube, through a 90° bend, and out the return nozzle into the tank. One way to reduce the water flowing out of the return nozzle and into the tank is to put several small holes in the flow tube. This divides the water from the pump; most will travel as intended but some will be diverted out the holes in the flow tube. It will then circulate through the pump section of the aquarium and go back down to the pump inlet. I go into detail for how to do this in my Flow Tube Modification page, as well as detailing why this flow change will be beneficial, especially if you choose to place a heater in the open area of the pump section. 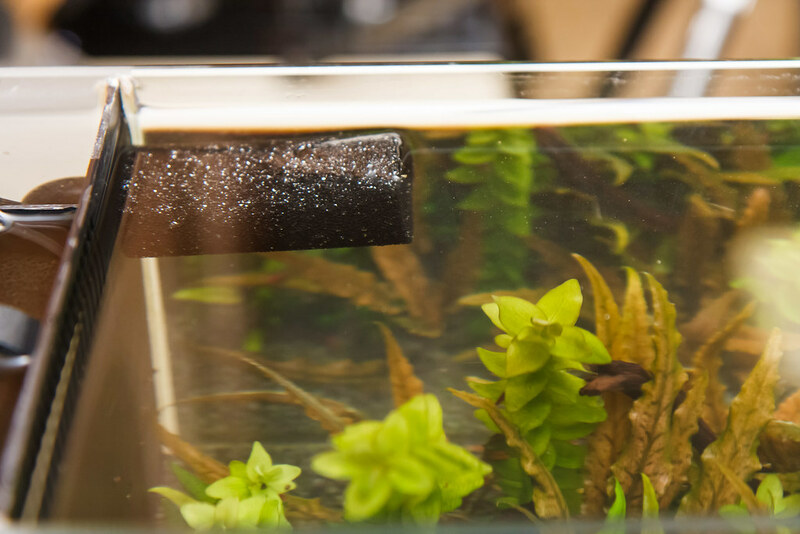 With these two simple mods to your aquarium, you have reduced the flow rate considerably to make your tank more Betta friendly while still maintaining plenty of flow for good filtration. Next up is how to make the water flow more hospitable to your long finned friend. Even with reducing the flow rate considerably, the water still exits the stock return nozzle in a very harsh jet. Your Betta will have places that it can shelter from the high velocity water, but much of the aquarium in a straight line back from the nozzle will push him / her around. You need to somehow diffuse the water from the return nozzle so that it isn’t coming out in a straight line but is spread out evenly and slowly. There are various methods to this, but they all revolve around utilizing a sponge of some sort. I haven’t tried this, but some internet forms have claimed good results from taking a pea size piece of aquarium foam (you can actually use a corner of material from the stock filter in the Spec) and placing it inside the flow nozzle. Start with a piece about the size of a bean, cut from the edge of your filter sponge. Turn the pump off, remove the return nozzle from inside the display tank, wedge the piece of foam inside the nozzle and replace it. Turn the pump on to test. If the flow is too restricted, just take it out, cut a tiny bit more off, and try again. This method is nice because it costs nothing and doesn’t change the appearance of your equipment. The downside is that this piece of sponge might not stay put and it will need to be cleaned / replaced occasionally as it wears out. An alternative to this is to place a piece of foam outside the nozzle to cover it and diffuse the flow. Fluval makes a replacement filter for their Edge series of aquariums that fits perfectly. Search for the Fluval Edge Pre-Filter Sponge . It is a cylindrical sponge that fits over the return nozzle and will very effectively make for diffused and slow water flow for your Betta. I have tried this modification out myself and have a page on it here. The last flow modifications are relating to the outflow from the tank back to the filter section. 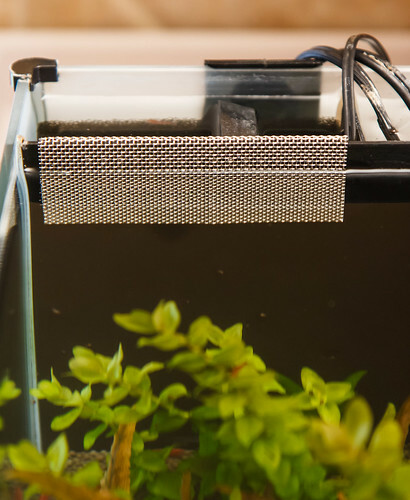 At the top of the baffle between the display tank and the filter section are a series of vertical slots that allow flow into the filter section. The flow speed is generally slow through these slots; however, some Bettas have been known to sleep up against these grates and their fins can get caught and torn in them. If this is the case for your Betta, you can cover the slots to keep their fins from entering. Sponge material can work here as well. Simply cut a rectangular section with a slot in the center most of the way through. wedge the sponge down over the black baffle with the slots between the two sections of sponge. You can also use zip ties to simply affix a flat sheet of sponge onto the outer face of the slots. Another optiion is to get some plastic mesh canvas that people use for cross sticking. You can find it at craft stores and it comes in white or black. Black blends in better with the baffle. Just take a small piece cut to size to cover the slots and use zip ties to affix into place. An even cleaner option that I have discovered is to make an overflow cover out of stainless steel – I have a page showing how to make your own. The last thing to mention is that there is a bypass slot toward the bottom of the black plastic baffle between the display tank and the filter section. Your Betta’s fins can get caught in this slot and there are other reasons for plugging this bypass that i detail on this page. It’s best to tackle this before you get water in the aquarium by filling with aquarium safe silicone. However, a bit of sponge can be wedged in there if you already have your tank up and running. Depending on how warm you can keep your home, you may not need a heater at all for your Betta. However, maintaining a stress-free fish hinges on keeping the water temperature as consistent as possible. If your house temperature drops down to the point that maintaining aquarium temperatures of at least 75°F (23.9°C) is not possible, then you should consider getting a heater. 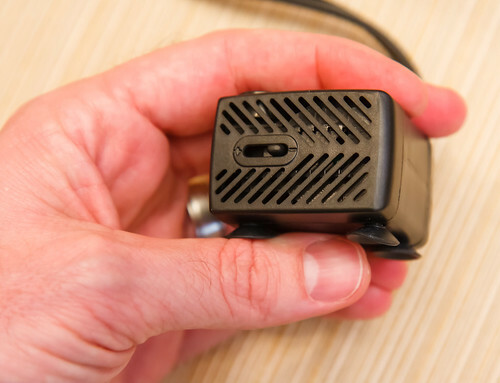 There are several options for placing a heater in the Fluval Spec Aquariums; look for a power of around 25 watts. I have a Hydor Theo 50 watt wedged in the pump section of our Spec V. It is a great little heater and fits perfectly in this hidden location. The temperature settings on heaters are often not calibrated perfectly – make sure to verify the heater operation and set point with a separate thermometer. If you really want to ensure consistent and safe temperatures for your Betta, consider utilizing a temperature controller to ensure the heater never fails in the ‘on’ position and kills your beloved pet. Some people with hotter homes will have the opposite problem and will have a hard time maintaing temperatures of no more than 80°F (26.7°C). Consider adding a fan if you are in this situation. Evaporative cooling can be very effective to lower your tank temperature in the summer. Please don’t think you need to take all the measures I am suggesting to make your tank Betta friendly, but I hope these very simple ideas will help you come up with creative ideas to modify your Fluval Spec to be the perfect home to your pet. 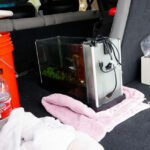 This entry was posted in Spec Mods and tagged aquarium, betta, fish, Fluval Spec, nano. Bookmark the permalink. I’m surprised you don’t have any mods to shrimp proof the spec V as you seem to keep shrimp.. I think? What do you suggest I use to cover the slots on top while still allowing water to pass thru? and the slit on the bottom ? When I first got shrimp, I added a piece of sponge inside the filter box at the top to block shrimp entry. After a week I got frustrated with keeping it in place (I didn’t shape it properly) and just left it out. I don’t think it’s a problem at all having the slots open. Small shrimp go in, feed on the top of the stock sponge, then swim out. The fluval spec filter is not the shrimp killing machine some make it out to be. I have since fashioned a sponge at the top as a filtration aid, but shrimp still get in there and find their way back out. The lower slot is filled in with silicone. Hi, we are in the process of setting up Fluval Spec V’s for my 2 bettas with your modifications, including holes in the tubing. Can you please clarify whether you recommend setting the pump to the lowest or highest setting? We greatly appreciate all the info! For a Betta, I would go ahead and set it to the minimum setting. If the flow is too low for your liking, it’s not that hard to adjust it after you get it setup. Just disconnect a few pieces at the nozzle up top, pull the pump up by the cord, adjust, and put it back down. I use a wooden spoon handle to scooch the pump around and press it down in place. Stupid question probably. I want to try the holes in the tube but if I botch it what is the right size/kind of tubing to buy to replace it? I put sponge inside the nozzle so my betta isn’t battered but I’m not sure I have enough flow going now to do anything effective. I still don’t understand it because I’m new to aquariums but the tank does look beautiful and clean. Honestly, the hose is one part I have not been able to source for replacement. If I find who sells the tube alone I’ll update. I didn’t worry much about botching it and it worked fine for me – I used a dremel bit. A drill bit would probably work. Even snipping the hose in a few places with scissor tips would probably work fine. If you don’t have a heater in the pump section you can pass on the holes for now and see how the flow works. I made the modifications to the filter and it greatly reduced the flow rate and surface turbulence for my betta. I have the fuval spec 3. Just a question: have you cycled your tank for your betta or do you just do water changes. I haven’t move my betta into the tank yet, but I’ve been told that these small nano tanks are hard to cycle (and maintain a cycle). It’s been suggested to remove the filter material and just do partial water changes several times a week. What has been your experience? I’m passing along knowledge as best I can, even though I don’t keep a betta. As far as cycling goes, the best method would be to do a fish less cycle using pure ammonia to feed the bacteria. This will take time (weeks) to establish. It will require testing in the interim to confirm the cycle is started and that ammonia is being processed. For a single betta fish, I would think you could get away with a 50% water change several times a week as a relatively safe alternative to the fishless cycle. Test the water for ammonia regularly through the week to monitor when you need to perform a water change. Eventually, the good bacteria will develop for the load of your fish. I’m not sure what you mean by remove the filter material. I’d leave the filter material in place and be careful not to rinse it out with tap water to keep the bacteria colony safe. If you put a few holes in the tube PLUS add a sponge on the outflow nozzle, do you think that would restrict it too much? It might, but I would think it would be good. Depends on the holes (how many/how big); there are several ways to change the setup to vary the flow. 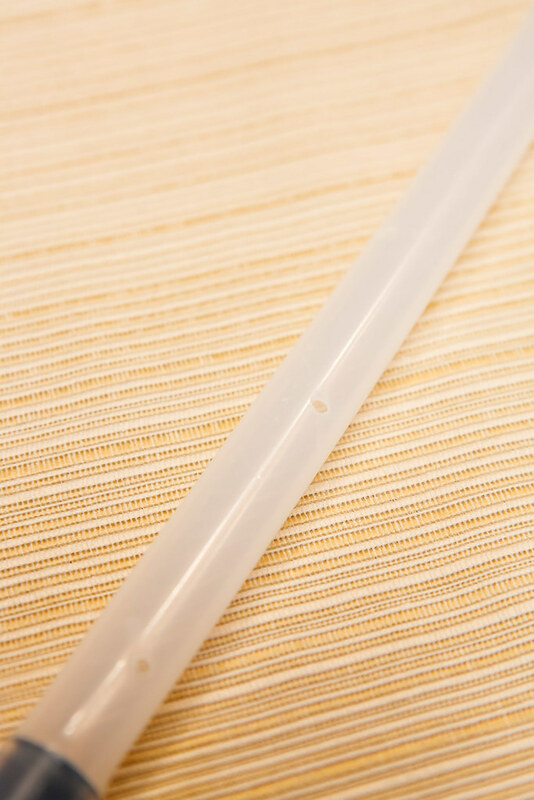 You could start with one or two small holes in the flow tube and add another hole or two later if the flow needs to be reduced further. If the pump slider is closed fully, you could open that up to play with the flowrate. If the sponge in/on the outlet nozzle restricts too much, just take it off. Hi. 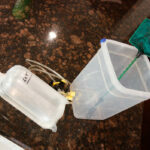 I have just finished modifying my Spec V. I had to cut a few holes and put the Fluval sponge on the output. Without the holes I couldn’t get the tank to the right temp. Now the temp is steady at 79 but I’m curious how I would know if I have restricted the flow too much? Silly question I know but I’m new to the hobby. Many thanks. I’d observe if the filter is pulling out gunk over time. If it doesn’t appear effective, you might have too little flow. Give it time and observe. What position do you generally set the flow nozzle? Angled down? Up toward the surface? Ect…. I usually set the flow nozzle slightly upwards and slightly toward the adjacent glass. By all means, play around with it to see how water flows in your tank with your particular decorations and livestock. Thanks! I’ve noticed one of my betta is very active and can mostly swim against the current, the other is super lazy and just leans against the intake no matter what I’ve done that you recommended to do to lower the flow rate. I’m getting the pre filter sponges tomorrow for the nozzles so hopefully that will help also. Do you notice different personalities between fish? Active, vs lazy…ect. Hi, I just bought a Spec 5, I used the Edge Prefilter at the outflow nozzle and set the water pump to max flow. I noticed the water flow seems to be quite weak after the prefilter was used, I try putting some flake food and it’s seems to stay or linger around the water area without much movement. Do I need to cut the edge prefilter size to more fitting? From what I read here, the water flow is strong even with prefilter and low setting, but mine seems like little to low water flow after prefilter is used in max settings. For unknown reasons, your particular pump might have lower flow than normal. You can always try setting the pump on the lowest flowrate, remove the sponge from the nozzle, and see how your betta does. How much output flow is too much? Mine is were my betta wont be thrown around the tank but he is pushed a little. Should it be absolutely still? Or should it have a bit of flow? I’ve been keeping it off but honestly I’m worried keeping it off will make my tank grosser faster. If by keeping it off you mean turning the pump off, I can’t recommend that. Have you done any mods to reduce the flow or diffuse the flow? I really can’t tell from here what is too much for your fish. If you use the prefilter mod or something similar I would imagine that would work out fine. Hi I was just wondering if you need to set the pump to the lowest setting and cut holes in the rubber tube combined having done both mods. I have currently have done both to my Fluval Spec 3 and I’m a little concerned that the water won’t filter as well. If you get the feeling that it isn’t filtering enough, you can always turn the pump back up to high and see how that does. Just disconnect the hose, pull up from the cord, adjust the slider on the pump, put it back. 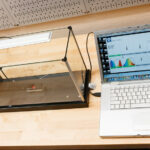 Every setup is different so I can’t say with certainty what is best for your tank. Nate, thanks so much for all your information on this site, it really is very useful. I just about followed everything you suggested in customizing the Spec V to use as a betta tank. I would’ve trusted your take on the Eheim Aquarium Thermostat Heater regarding the height. But I found it on Amazon one day for around $13 and that’s too good to be passed up so I bought it thinking I might be able to jiggle it somehow to fit. Well, it doesn’t. It is also absurdly long, about some 4 inches longer than the Hydor Theo. So, I used it for my other small tank and used the Hydor from that tank for the Spec V, which of course fits perfectly. A top layer of fiber floss to filter the large pieces of waste and such, then the 2” block of sponge for the next level of mechanical filtering, then a layer of filtering pad for micro filtering, then the Biomax layer which I have bought extra Biomax pellets for a total weight of 4+ oz and put in a nylon stocking, then the 1” sponge layer, then the Purigen, and finally either the other 1” sponge or another filtering pad layer. Then tie it all up using some kitchen twine so the whole thing can be easily put in and removed for cleaning. The tying is a little bit of a chore since all the layers are soft and not flat. The doubling of the Biomax pellets should up the biological filtering capacity to the equivalent of a 50 gallon tank, I would think, since that’s how heavy the box of AquaClear Biomax is for use in a 50 gallon tank. I don’t know for sure if it can be translated this way but that’s my guess. Naturally, the Spec V is a small tank and I don’t want to over-populate especially after I put in all the plants I want to but I can’t resist trying it out. That is a very ambitious filter media plan! It should provide very good filtration and I’m interested to hear how much better it is than the stock. I do feel for your effort of tying it all up as that will indeed get old. i followed many of these suggestions for making this tank betta friendly so thank you 🙂 BUT I can’t get this tank to cycle to save my life (been over 3 months). I am very familiar with the cycling process so know how to do it lol. There are a couple distinct differences between this tank and many others I have cycled. The biggest of which is now that I have made it betta friendly I can’t help but think there is simply not enough oxygen for the bacteria to survive. Is the latter possible? I really don’t want to put in an airstone, but I’m getting desperate. The other is just the size of the tank…ugh should have went bigger. BTW betta is already in the tank, I do about 2G water changes every day or occasionally overy other day to keep amonia no higher than .25 ish. My poor fish. My fishless cycle took longer than I expected also, but not as long as yours. I don’t think lack of oxygen is your problem. The only thing I can think of to help is to get some media or something from an established tank to kick-start the bacteria. If you start with no seeding material, getting a cycle going can be very tough. Lovely site, Nate! I bought a Spec III/2.6g/10L recently and I am housing a Betta in it. I did some of your turbulence reduction mods and they’re great.The last time I had a tank was 10 years ago. I had a 75 gallon tank with goldfish in it, and now I have a Betta in a nano setup. Quite a change, but I’m so happy to get back into the aquarium hobby. This site is great! Wonderful layout. Did you do this yourself? Thanks for the comments and glad you are back in the hobby. Everything on the site is wordpress, and the layout / tools are downloaded as freeware. So I didn’t do much other than put it together and write a bunch. Just want to say thanks soooo much for your advice on setting up this tank, I got a spec 3, (yeah, not many of them left anymore but I was pleased to get it) and followed all your suggestions and I have the most perfectly runny aquarium for my little betta. I’ve had it going for a month now and it’s working great. He’s as happy as larry, built 2 bubble nests since he’s been in there and we’ve got quite a little friendship going. I had a great time planting it out too, quite proud of it, it’s just gorgeous. Anyway, main point of this message was to say thanks, I looked up dozens of sites before I found this and it was all so perfectly laid out for a newcomer like me and I could follow along so easy. Thanks for the kind words! Glad the site information is helpful. I made the site just to help others and provide information where I saw little was offered on the web. Sounds like you have a great tank! So, I have this tank and my poor Betta has been sick. Without telling you all the very long details – I found out part of the reason was due to the carbon filter leaking carbon into the water. I didn’t notice at first due to all the frequent water changes but I was out of town for acouple days and came back to black soot on the gravel floor and obviously he is not doing well. I have put him in a “hospital” tank for now while I sort this out. My question is – why is this carbon filter needed?? I have been told from other aquarium pros that it’s not needed. I have a page where I talk about the bag of carbon. Short answer: most people would be better off not using the bag of carbon and just using two bags of ceramic rings (biomax). I just ordered the black plastic mesh as you recommended as I noticed my betta (like many others) is camping out at the intake slots. I know that you used the stainless steel version, but did you have any trouble getting the plastic to bend and fit like the steel version? Also, I’m assuming I should get the smallest black zipties I can find right? Just not sure how I’m going to get the plastic to fit correctly and where to put the zip ties. Thanks!! I wouldn’t try and bend it like the SS version. Just cut a flat piece to cover the slots. If you can’t affix it to outside with zip ties or something else, consider a large piece of mesh wedged down on the inside, held in place by the sponge filter. Hi all…could we discuss lighting on this tank? I have an a few marismo balls and a driftwood log with Marismo attached and now I have the algae problem that just won’t quit in my tank. Mostly hair algae. No other plants in the tank, and a single betta. I’ve read tons of sites that point to lighting. There’s no window near the tank, just the provided light. Thoughts on how to lower lighting levels to stunt the growth but allow me to actually see my betta? He’s very active and I enjoy “Bully” very much! Do you have the stock light? I’d recommend continuing to clean out the hair algae as much as possible as it forms, and ride this out. I had hair algae in the first 1-1/2 months I setup the tank. At some point, it went away and has never come back since. Hair algae in particular seems to be a new tank issue; not sure how long yours has been setup. Thanks so much for all the mods. It truly is the best resource on the net for this tank. I had the older spec 3 with the light that seems to konk out after a while, just plain LEDs. I tried to replace the light but it was only $25 more to get a new tank, so I did that. With the old light, I never had an algae problem. The new, updated light (which is a different spectrum) has caused the algae to grow like crazy in our tank. I now have to leave the light off most of the time to limit the algae growth. Not sure which light you have, but that could be the problem. I would be interested in any light mods you can think of. thanks again for all the great content! Thanks for giving some feedback on the new light. I do need to get ahold of the new versions and update the reviews. Yes, for lots of people the higher light levels of the updated specs is good, but it will make problems for other people. I’ll start to think of ways to mod the light to knock down the light output for those that don’t need as much. Great blog! I just set up a new Spec III for a betta and I think the light is extremely bright. I was thinking of using masking tape over some of the LEDs to dim it a bit and make it reflect less off the lid. Anyone think that would work or cause any problems? Thanks for the reply. I have the new Spec III with the updated light. I did buy a yellow mystery snail and it is cleaning. I am also manually cleaning like you have suggested. I am going to ride it out. My phosphate are off the charts and PH is 6.0. my tap water as no phosphate and PH of close to 8.0. I can only assume this is due to new planted tank and the plants and algae. I only feed once a day I am trying to feed less but I think I am ok. I am considering getting a Spec 3 for my betta and your review of the system and the tips to get it going have been very helpful. You can use a traditional thermometer attached by suction cup anywhere on the inside of the display section. Or you can use one of those type you stick on the outside of the glass – attach on the display section or the filter section. The filter section has circulating water in there and it’s basically the same to monitor your temperature. Or you can go digital – see my page here. I recently put my betta in this tank and I noticed his tail was being eaten up (most like by the slots). I tried you cross stiching fabric fix but I noticed that the water level in the filter chamber is super low, have you had a problem with that? Is the sponge a better method? I’ve not seen the issue of the water being restricted. The sponge might be a better fix for you and your betta. One comment: the problem with shrimp getting into the filter compartment isn’t that they’ll get stuck and injured in the normal course of events; it’s that when you do a water change, they don’t leave the filter compartment and so end up marooned on the sponge, hopping around willy nilly as they do. Or do you have a way to prevent that? How do you get them OUT of that compartment when doing water changes?? I have very rarely (2 or 3 times in over a hundred water changes) had them get marooned in the filter section during a water change. I just notice it, grab them, and toss them back into the tank. Especially with an extra section of sponge on top of the stock filter media, they don’t get in there anymore. I didn’t read all of the replies so it may have been mentioned, but I read about another mod for the vertical slots. An amazon reviewer hiked up the filter a bit and used one of the twist ties that came wrapped around the cords to hold it up at the top of the slots. We’re trying this now (still about to do a fishless cycle first) but may switch to the plastic canvas method if I can find it in black around here. Thanks for all the articles. Super helpful with our new tanks. They typically never need replacing and can be cleaned occasionally. I’m looking into getting a Fluval Spec V for a betta, and I was wondering what the prospects were for running this tank with a slightly lower water level? Ideally, I’d like the water level to be 1.5 – 2 inches below the top of the glass. It looks to me like the outflow is just too high, but I’m wondering if there is a way to run the tank like this. For example, could I drill some holes slightly lower down, below the current outflow? What would the effect on the filtration system be? The reason for the lower water level is: 1. Bettas like to jump and having such a high water level makes me nervous, and 2. I like to set up my tank with some sort of feature that protrudes above the surface of the water to facilitate nest building. Any advice would be amazing, because this tank looks otherwise like a great option. Let me first say: you can operate with the the tank water level about 1-1/2″ below the rim without any modifications. If you want to look into running the water level lower, the limiting factor probably won’t be the outflow (the nozzle where water discharges into the display tank) but will be the slots for the water entering the filtration system. If water dips below the bottom of those slots, the filtration system won’t work very well. A patient person could use a dremel type tool to carefully extend some of those slots downward, allowing for a lower water level. For the discharge nozzle, you could drill another hole lower, shorten the flow tube, and mount the nozzle lower down. This would take considerable care to make sure you don’t break these (black) plastic baffles as you cut on them (they are thin and too much force/flex could harm them or where they attach to the glass with silicone). I think this may add to much flow to the surface and the betta will get caught. I have done some the modification except for drilling holes on the pump tube, and closing the bypass. For the intake of water into the sump instead of using your mod. I have placed a thin ploy fiber and carbon filter from a nono filter held in place by plastic clips so that his fins to not get caught. What can i do to get this film out? Hi Brooke, there are two things that I do for Bioflim. 1) I used a sharp knife and cut a vertical line on the tip of the (front part)sponge. That allowed for more water movement and I aimed it up to the surface. My Betta got used to it and loves it. 2) I also use a paper towel when needed just place it over the top and it will pick up the bio film. Every morning before I leave I manually open the cut I made on the sponge to make it a bit wider just to get that extra movement. I works for me. In my tank in the sump I have a heater, air stone and a UV light air stone and UV are on a timer. I also use a filter pad from the fluval edge I cut it an place it in front of the skimmer opening. Behind the skimmer I use purigen, the bio media, then on top of the black sponge I have a polishing pad and carbon. I recently got a fluval spec 5 and have stocked it with my betta and some other plants, one of those plants is frogbit but i think it isnt doing well because of the condensation from the hood. If i removed the hood/cover will my betta jump? THANKS for this! I didn’t know there was a flow control under the pump – the manual that came with my Fluval Flex didn’t mention it. And poor Biff spends all his time up in the corner on the back left, where the water goes back into the filtration side of the tank. He doesn’t even go down by his “houses” anymore to sleep… I was going to move him back to the other tank I had, but really wanted to make this one work. I even had removed the two flow nozzles from the tank hoping the larger area would slow down the flow. It did, but still not enough. Will try the flow rate adjustment, and may be a few holes if still needed, and maybe poor ol’ Biff can soon be in the rest of the tank again. I hope it works well. Biff deserves the best! Hey there, I‘m so thankful for your site, because I‘m thinking about buying the Fluval Spec V for my betta but I don‘t want to use the original filtration system. So I‘m thinking about removing the wall between the ‚swimming room‘ and the filtration system completely, of course carefully, with a cutter knife. Is that even possible if I‘m careful enough? Yes, I think it would be possible. I haven’t tried it, but I don’t see why not. Like anything, take your time. You will end up with glass (covering the pump / filter section) that has some sort of decal on it (bunch of holes). I haven’t tried to see if that is removable. Thank you for all the information! I have 2 FLUVAL Spec 2.6 tanks with a Betta in each and honestly, they do NOT seem to be happy at all – I assume due to the force of the flow from the pumps (which I do have turned all the way to min.) I am also having a major problem with the white film on the water surface! I do not over feed & I am very faithful in doing weekly water changes & other tank maintenance, so I’m quite frustrated! Would like to try the modification of putting the “Edge pre-filter” on the output nozzle & trying to plug the lower intake hole, but if I’m already getting thick white film on the surface, slowing down the surface agitation will most def. make this worse! Honestly, reading about all these modifications that are necessary to make this tank hospitable for Bettas is making my head SPIN!!! Seriously considering chucking these tanks & starting over with something else… but don’t know what?! Just want my Bettas to be happy & healthy – that’s all!!! Any suggestions? Sorry for your issues. Have some patience. I’d go ahead with the flow reduction ideas if they seem like they don’t like the high flow. New tanks (or even old ones) can act weird. See if you can wait out the white film. Maybe play around with the water level – sometimes you can run it a bit lower and that increases the velocity through the overflow grates, which might have a skimming effect (to remove the film). Dan – Thanks so much for this info.! Will definitely look into it! 1. Upgraded the lighting: Got rid of the stock light and replaced it with a Finnex FugeRay Planted+ Aquarium LED Light Plus Moonlights, 16-Inch. 2. Modified the airline hose: Used a wood screw to make 5 random holes (2 inches apart) in the Fluval airline hose to get water flow into the pump enclosure and control the heater temperature (which also resides in the pump enclosure). Using the wood screw prevents the holes from getting to large and damaging the hose. 3. Modified the water flow into the tank: Cut a very small section of a Scotch Brand Stainless Steel Dish Bowl Cleaning Scrubber and inserted it into the duckbill to lower water flow into the tank. The stainless steel is easy to cut with a pair of scissors. Just grab a few of the curling strands and snip with scissors. Then, remove the duckbill from the airline hose and push the stainless steel clipping into the duckbill. Reattach it to the hose and you’re good. The stainless steel won’t corrode, collect algae, or wear out. Much better solution than using the big, ugly Fluval pre-filter foam which doesn’t work in a nano tank. 4. Added the Fluval 20g Co2 diffuser for the plants: The instructions for installing the unit state that you need both the upper and lower plastic containers for diffusion, but you don’t. Just use the upper plastic container. The two containers are too big for the nano tank and look unsightly. Just use the top container and place it low at the back of the tank. I hide it behind plants and mopani wood. More mods in the works, but that’s a start.